Don't miss the April issue of Rugby World to find out more about our concussion study! HomeNewsDon’t miss the April issue of Rugby World to find out more about our concussion study! The latest issue of Rugby World magazine features our RECOS (REpetitive COncussions in Sport) study as part of an eight-page special report on concussion – the biggest issue in the game. 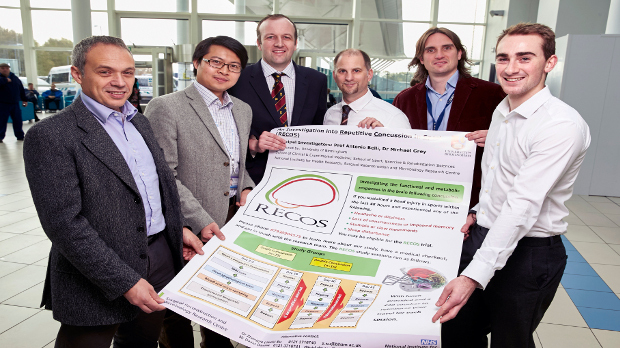 The reporter met Professor Tony Belli and the RECOS team at the Queen Elizabeth Hospital to find out more about their work studying concussed athletes. Within 72 hours of their latest concussion the athlete is physiologically tested and then retested at fortnightly periods until they are symptom-free. The resulting feature includes comments from Prof Belli (pictured far left) and Moseley Rugby Club’s team doctor, maxillofacial surgeon Doug Hammond (pictured third from left). Prof Belli said: “In the last few years it has become apparent that this is not a small-scale problem at all – 1.4m people in the UK are affected by concussion every year and in sport and the military this is a particular problem. If you would like to take part in the RECOS study, or find out more, please contact the team on 0121 371 6741. To read the full article please visit http://www.rugbyworld.com/news/whats-in-the-latest-rugby-world-43514.